Elmo plays and talks. If you haven't played with Elmo for a few minutes, he will try to lure you back over with a few words. So Elmo is sitting alone in front of the tv, Casey having been distracted by Mommy. 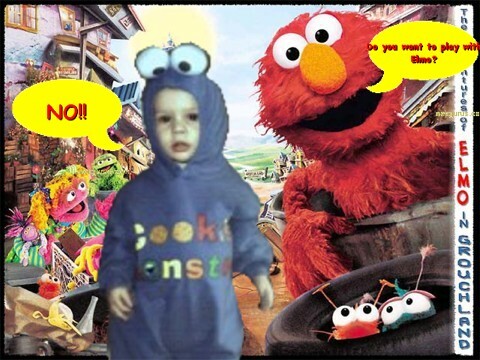 Elmo tries to get Casey's attention. Casey refuses in none to polite a manner. move the pointer over the picture to read Elmos balloon better. Well, you really did have to be there. It's just not as funny in print.